unveiling in the main auditorium. The unveiling looked doomed, however, as last-minute problems with the car cropped up. The suspension snapped and the car would not move. Tucker ad-libbed on stage for two hours while emergency repairs were carried out. It was finally pushed onto a turntable by hand, and the curtain was lifted to thunderous applause. Tucker was joined on stage by his family, with his daughter smashing a champagne bottle on the “Cyclops Eye” and soaking her father. Also on stage were Tucker’s engineers, still covered in grease from the last-minute repairs……. The first postwar Mille Miglia (“Thousand Miles”) began in Brescia, Italy. The Mille Miglia was originally conceived by Aymo Maggi in 1927, who gained the approval of the Fascist government in Rome to run a road race from Brescia to Rome and back, over Italian roads. The course was plotted for 1,000 miles [21 June 1947]. This postwar version had 155 starters. Aided by a violent rainstorm that hampered runner-up Tazio Nuvolari’s small Cisitalia convertible, the driver Clemente Biondetti won the race in an Alfa Romeo. 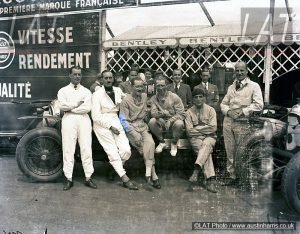 Even in its new incarnation, Italian drivers and cars dominated the race, which popularised such powerhouse brands as Alfa Romeo, Ferrari and Maserati. Tragically, driver Alfonso de Portago blew a tire and spun off the road during the 1957 edition, killing himself, his co-driver and 10 spectators. Three days later, the Italian government banned the Mille Miglia and all other motor racing on Italian public roads……. 60 years ago this week, Pontiac announced plans to sell British-made Vauxhall cars through its dealer network [20 June 1957]…… Charles King (89), the first person in Detroit to design, build and drive a self-propelled automobile – 3 months before Henry Ford built his automobile, died [22 June 1957]. The Detroit Journal of March 7, 1896, reported that King drove his motor-powered vehicle down Woodward Avenue – being the first person in Detroit to build and drive such a vehicle. The Journal also reported that King made and sold the first complete automobile in Detroit…….The last Hudson rolled off the Kenosha assembly line in Wisconsin, US [25 June 1957]. There were no ceremonies, because at that point there was still hope of continuing the Hudson and Nash names into the 1958 model year on the Rambler chassis as deluxe, longer-wheelbase senior models. 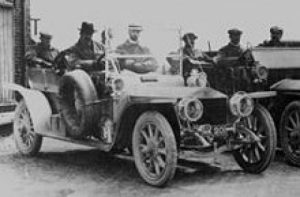 The Hudosn Car Company was founded by eight Detroit businessmen in February 1909. Among them was retailing magnate Joseph L. Hudson. Another was Roy D. Chapin, Sr., who led the new firm to high prosperity as its president from 1910 to 1923. 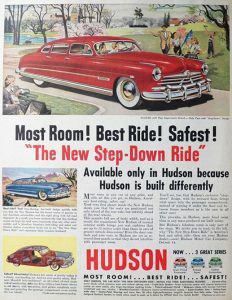 Hudson built some of America’s fleetest and finest cars during its 48-year history and was often among the industry’s sales leaders through 1950. A key early success was the low-priced four-cylinder Essex introduced in 1919.By 1925, it had boosted Hudson to third place behind Ford and Chevrolet. Hudson then ran third, fourth, or fifth on volume that reached 300,000 cars by 1929. Unfortunately, total sales fell sharply in the devastated Depression market. 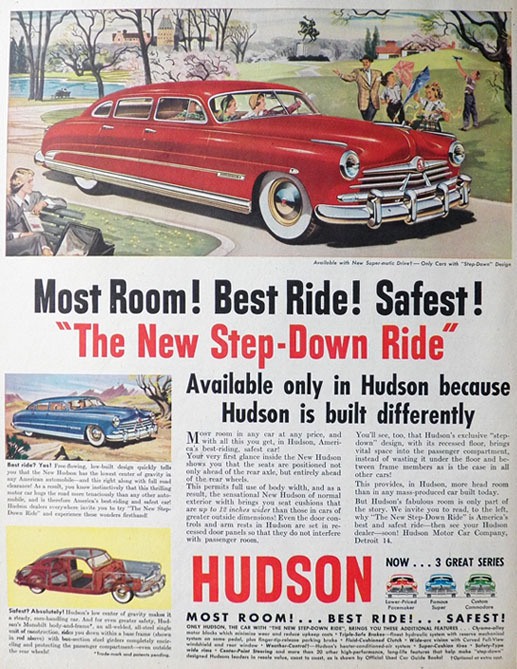 Had it not been for the speedy, inexpensive Essex Terraplane, Hudson might have folded by 1940. The firm forged an enviable reputation in the 1920s largely with its Super and Special Sixes: big, smooth, solid cars offering good performance for the money and fine reliability. But with the advent of an Essex Six in 1924, Hudson decided to move upmarket. 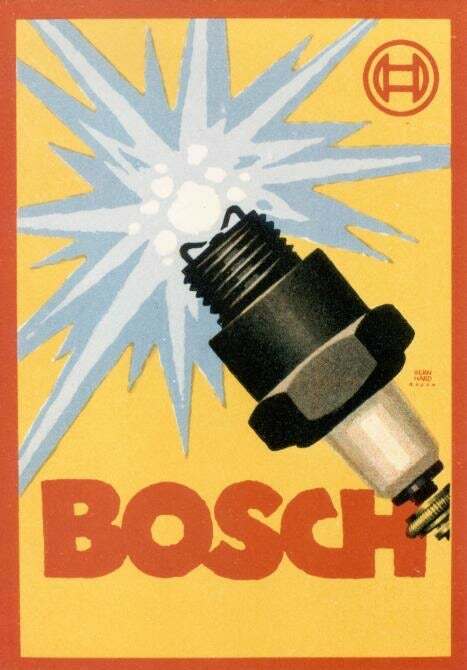 The result was a single 1930 line called Great Eight. Great it wasn’t. 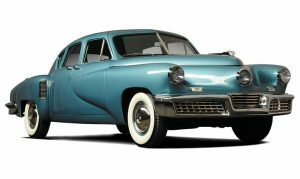 At 213.5 cubic inches, its engine was actually smaller than previous Hudson sixes, had just 80 horsepower to move a heavy chassis, and wasn’t as sturdy. It did boast an integrally cast block and crankcase, and was the first straight eight with a counterweighted crankshaft, but its splash lubrication system was outmoded. Hudson stayed with this engine for the optimistically named Greater Eights of 1931-32 — in retrospect it was a mistake for a depressed market where sixes would surely have sold better. Displacement was increased each year: first to 233.7 cid and 87 bhp, then to 254 cid and 101 bhp. Another 1930 setback was the Depression-related closure of Biddle and Smart, Hudson’s longtime supplier of magnificent open bodies. The company thus turned to Murray and Briggs for phaeton and speedster bodies. A few eight-cylinder Hudsons of this period also sported dashing coachwork by the renowned firm LeBaron. Through 1933, Hudson Eights offered numerous body styles on wheelbases of 119-132 inches: roadsters, Victorias, convertibles, sedans, town sedans, coupes, and Broughams (two-door sedans). It was an attractive line that would have done justice to far-costlier brands, but it wasn’t successful. The Greater Eight managed only 22,250 sales for 1931. The ’32 total was below 8000, despite unchanged prices and lush new Sterling and Major series. Seeing the error of its ways, Hudson launched a new Super Six for its 1933 “Pacemaker” line — the car was essentially the 73-bhp 193-cid Essex Terraplane engine in the 113-inch Hudson chassis. That year’s Eights comprised four 119-inch-wheelbase standard models and five luxurious Majors on a 132-inch platform. But production bottomed out at under 3000. Interesingly, Eights outsold Sixes nearly 2-to-1. For 1934, Hudson again abandoned sixes, reserving them for the new Terra­plane line that replaced Essex as the firm’s “companion” marque……..40 years ago this week, the Scandinavian Raceway staged the Swedish Grand Prix, which was won by Jacques Laffite driving a Ligier-Matra JS7 [19 June 1977]…….30 years ago this week, Britain’s most persistent learner driver, Mrs Git Kaur Randhawa of Hayes, Middlesex finally passed her driving test at the 48th attempt after more than 330 lessons [19 June 1987]………The Detroit Grand Prix held in Detroit, Michigan over 63 laps of the four kilometre circuit for a race distance of 253 kilometres, was won by Ayrton Senna in the active ride suspension equipped Lotus 99T [21 June 1987]…… on the same day [21 June 1987] Drivers Roy Lambert and Ray Hancock, with navigator John Taylor, completed a 3,609-mile course around Britain in a diesel-powered Ford Fiesta 1600. The fuel consumption for the 7-day journey was 85.2 mpg…….20 years ago this week, Auto Club Speedway (formerly California Speedway), a two-mile (3 km), low-banked, D-shaped oval superspeedway in Fontana, California which has hosted NASCAR racing annually since 1997, was officially opened [20 June 1997]. 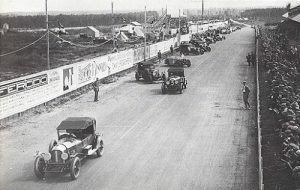 The first race, a NASCAR West Series race, was held the next day. The speedway is also used for open wheel racing events…….10 years ago this week, the Vatican issued a set of “Ten C ommandments” for drivers, telling motorists not to kill, not to drink and drive, and to help fellow travellers in case of accidents [19 June 2007]…… A lorry driver caught steering with his knees while he ate spaghetti from a pan was jailed for eight weeks after he admitted dangerous driving ‘[20 June 2007]. Martin Veens was spotted driving his left-hand 40-tonne truck erratically on the A55 road near Northop, Flintshire. Prestatyn magistrates heard how the North Wales Police helicopter’s camera filmed him holding and eating from a saucepan as he steered with his knees. Veens, from the Netherlands, was banned from driving for a year….. On the same day [20 June 2007] Bosch manufactured its ten billionth spark plug. The landmark plug was made at the company’s Bamberg plant in Germany, which was opened in 1939 and has manufactured the majority of the company’s output. Laid end-to-end, the Bosch spark plugs that have been made would form a chain stretching for more than 348,000 miles, circling the equator approximately 14 times……… The Ferrari around the world relay comes to an end at their headquarters in Italy. The marketing ploy was in celebration of Ferrari’s 60th anniversary [23 June 2007]. The relay started on January 28 in Abu Dhabi and traveled through 50 countries. Thousands of Ferrari owners participated all over the world carrying a symbolic baton that represented the company.